So you think your kids are over-tested, with too many high-stakes assessments at school? The Miami-Dade School District agrees with you. For the third time in the past three school years, the Superintendent has picked up his axe to whack off a few more assessments. “It is important to know how and how well children are learning. How well they can demonstrate proficiency, but that should not come at the expense of overburdening teacher, students and parents,” said Alberto Carvalho, Superintendent of Miami-Dade Public Schools, at a news conference Wednesday morning. 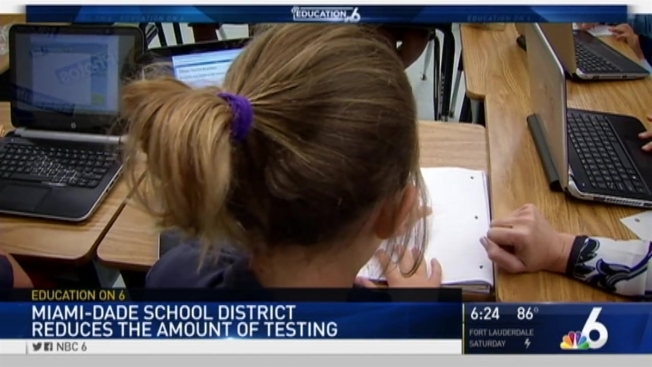 The district is eliminating 12 mid-year assessments, impacting students in grades 3 through 8. The tests cover language arts and mathematics. Carvalho says the testing was redundant, and front-line educators agree. “There’s so many different tests that the boys and girls take that even if we eliminated some of them, they’re still assessed so much that the criteria and data that produces for us is actually enough for us to know where the students belong,” said Melanie Fishman, principal of South Pointe Elementary School in Miami Beach. The superintendent says he’s responding to complaints from parents about over-testing, continuing his pattern of cutting back on high-stakes assessments. “We ought to continue to reduce the amount of testing while emphasizing and elevating the quality of teaching in our schools,” Carvalho said. By cutting a dozen assessments, the district returns 185 hours of class time to students and teachers. The teacher’s union loves the move. “To really explore things that can’t be tested and to really have that autonomy and to have the academic freedom to do the things we want to do with our kids,” said United Teachers of Dade president Karla Hernadez-Mats. Eliminating 12 tests this year doesn’t compare to the more than 300 assessments cut in 2014, when there was more fat to cut, but it does reduce a lot of stress for students. The superintendent says he’s keeping his axe handy as the staff looks for other assessments to eliminate.